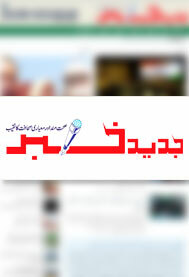 Jadid Khabar Urdu Daily is a newspaper from publish from delhi, India. The Jadid Khabar Urdu newspaper covers local news, Minority News, International news, Muslim news, Sports news in Urdu Language. Masoom Muradabadi is Editor of the Newspaepr. Jadid Khabar Urdu Epapr is available on internet.